Fireplace dampers sit almost directly above the heat of the fire. Over time, the extreme heat and rapid change in temperature. This can warp and damage the fireplace damper, thus needing replacement. A damper must be in one piece that is snug to the flue in order for it to work properly. If the damper cracks while being rapidly heating and cooling, it will no longer work properly. 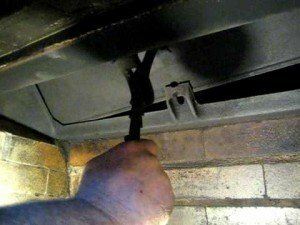 Replacing a fireplace damper by yourself is possible, and you can save yourself some serious money by foregoing professional consultation. One step that folks who want to complete the job themselves often skip is actually removing any debris. Clean any debris up where the damper sits and also in the firebox itself. Any ashes in the firebox should be removed and thrown away. Be sure that the ashes have fully cooled before manipulating them. We recommend putting the ashes into a metal can. From here the process is actually quite simple. There will be a rod that is fixed inside the chimney by nuts. Use a wrench to loosen the nuts and remove the metal rod. The damper itself will now be able to be twisted off. If your damper has significant rusting, this part may be difficult, and if the metal rod itself has rusted you will want to replace it and the corresponding nuts. You may want to consult a professional in choosing a new damper, but if you do not want to, simply taking your existing damper with you when you go to get the new one will allow you to compare dimensions and ensure that you have a proper fit. Very large chimneys may need custom made dampers, but this is rarely the case. Installing the damper is quite easy. Simply slide it back onto the rod in the same fashion that you removed the old damper and fix the rod and damper back into place using the same nuts as before. Be sure it is securely fastened and that it will not wiggle or fall over time. Despite the simplicity of replacing a fireplace damper, I have heard from folks who have installed the damper incorrectly that they lit their first fire after the replacement and their whole room filled with smoke! This is no problem and is usually not the fault of the damper’s construction. Put the fire out and look closely at the manufacturer’s instructions to ensure that you have installed it as the manufacturer had intended. If you are still experiencing problems, consult a professional. Read more about how to solve chimney smoking problems here. When replacing your existing damper, a product now available on the market is called a top sealing damper, where the damper is actually located at the top of the chimney, controlled by a cable that reaches down the chimney, which prevents heated air in the winter from being lost up and out of the chimney. 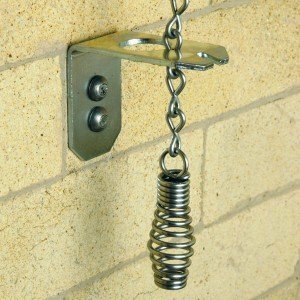 LockTop top sealing damper systems are generally what are installed by professionals these days because of their efficiency and ease of use for the customer. Do you know where I might be able to find a damper plate for a vintage Majestic 28-30 throat damper? The one in my 1940s-era fireplace is missing. I would be willing to buy the entire damper, if salvageable, just to get the plate. I would just keep on doing what you are already doing and just keep on drilling down on the internet. Possibly a top (sealing damper like a Locktop type) “might” be an alternative. Also contact a couple of chimney Sweeps in your area. Don’t forget many of the Majestic parts are still available. Take lots of pictures and share them with the world! Would installing an enlarged flue prevent the smoke problem with our double sided fireplace? Our current flue is on one side & doesn’t sit directly above the grate. It is intersting what you sad about the damper position, possibly trying to re-position the grate off center might help as well as playing with the wood load. I do not think increasing the flue size would help an most likely will only cause it to smoke more. I feel a double-sided fireplace are always a problem, that is unless you have a “positive pressure” from within the firebox pushing the smoke up the flue. Something like a gas-log starter would most likely help, but may not be possible. Sorry to say but historically I have found that masonry see-through fireplaces are problematic and just don’t heat a room and are often smokers to boot. This is primarily because they don’t incorporate a “back wall ” that is designed, to function to direct and to curl the smoke up the chimney, while at the same time reflect the heat from the fire back into your living space. It is my own personal feeling that a see-through fireplace design, should incorporate LP or a natural gas supply to work properly and consistently. My wife and I once had this same issue with our masonry see-through fireplace, and we chose to install a “one-sided” direct-vent gas fireplace insert. I will say that we enjoy the beauty of the dancing yellow flame, while at the same time of have the ability to adjust the flame height and to control the blower fan speed, all from our remote control. Debby, I honestly don’t believe installing a larger flue will prevent your smoke problem, it is my opinion that it will only cause more smoking issues? Moving your log grate around in the firebox area is certainly worth trying. Recently a friend of mine who has a new vacation home located in a valley and sits on a rather large lake in Tennessee, said that by his sliding four bricks under the legs of grate, resolved his smoking problem. I told him, that was just way to simple of a fix! I wish all of them were that easy to resolve. What raising the grate does, is to raise the “center of the fire” up closer to the damper opening an pushes the smoke up just a tad quicker. Historically I have found that masonry see-through fireplaces just don’t seem to supply any heat and are often bad smokers and end up not being used at all. I feel that for a see through fireplace to function consistently, it needs to incorporate a gas log starter. Again the only radiant heat that you will feel, is by having your glass door “open”. The primary reason see through fireplaces don’t function, is because they don’t incorporate the design of a “back-wall” that functions to direct and to curl the smoke up the chimney, while at the same time reflects the heat from the fire back into your living space. I once had this same issue with my own masonry see-through fireplace, and I chose to install a “one-sided” direct-vent gas fireplace insert. And I will say that I enjoy the dancing yellow flame, while at the same time of have the ability to adjust the flame height and to control the heat of the blower fan speed, all from our remote control. To benefit you, as well as our other readers I have provided, my (7 part) step by step construction of a See Through Fireplace. Again this is strictly a decretive fireplace and not a heater! My damper is damaged because it sticks badly. All the companies I’ve contacted in my area want to use the top sealing damper thing. But, how does this work when I’m in a condo and the top of the fireplace has a raised protective cover that covers 2 holes (one from my condo’s chimney and one from the condo above me)? Anne, personally I would have to discover why that damper is stuck. Is it because it is out of round, warped metal or just rusted closed? Then I would be checking to see if there is a replacement damper blade available from the manufacturer. Most competent chimney sweep contractors can install this for you! To start your hunt, grab a flashlight and begin to look for a small metal tag that may be riveted to the fireplace metal framing. It is hiding there somewhere, this tag will provide you with the needed information of who the Manufacture is, the model number and serial number. Then go online and start gathering your information. While hunting for this damper replacement part. I would also be looking for “that manufacturer’s UL listed the set of “glassdoors”, and that is if they were ever manufactured. My experience is that many prefab glass doors will work as well as a damper, in controlling air movement of the fireplace. May I caution you DO-NOT put just any set of doors on your fireplace, as many glass doors are not tested for your unit and may end up blocking air vent that is required to cool the fireplace off. I would also caution you on installing any type of top sealing damper on your condo chimney top. As it most likely is not UL listed for your fireplace. Also, let’s not forget that you have that unique situation where I believe someone has installed “sides” on the top, not design or provided by the manufacturer. In the past, I have dealt with draft and smoking problems when some on install aftermarket (shroud metal side covers) that were not designed and UL tested for that fireplace manufacturer. I was confused by your answer but then I realized that maybe you are talking about a prefab fireplace. My condo building (over 30 years old) is brick, the fireplace both inside and outside is also brick and when I had someone clean it they said it was a masonry fireplace, So, does this change your answer? My apologies to you Anne, and yes I did jump to the conclusion thinking that you were referencing a prefab fireplace. Please allow me to re-edit my reply. I would still have to discover why that damper is stuck. Is it, warped metal blade or just rusted closed? Then I would be checking to see if there is a replacement damper blade available from the manufacturer. To start your hunt, grab a camera, flashlight, and tape-measure, and get into the firebox (after it is cooled off wood ashes removed, that is, assuming that is wood burning in hopes of discovering the manufacturer or your damper. Often the Mfg name is embossed on the damper frame (i.e. Vestal, Majestic or Donnelly). All of these manufacturers’ have been very popular over the years and may still be available at your local brickyard. On a personal note I have purchased many dampers and just used the valve blade and handle and threw the frame away. With all of that being said, if this were mine I would have a top-sealing damper installed. If this was my property, using a *Locktop 2 damper. Lock top 2 damper’, offer a rain cap. spark arrestor animal screen and damper all in one. Another benefit of using a top sealing damper as it actually has a payback (ROI), as it will save you energy dollars. Installing a top sealing damper actually allows for the preheating of the entire chimney flue stem with warm house air, often making it much easier to start a (wood) burning fire, while at the same time sealing the cold air out, while not in use. Remember, it also prevents hot air from being pulled down the chimney during the summer–time AC usage. Again thank you for your clarification. Burn safe and warm while saving some energy! If the damper is missing is it required to replace it in the case a vented or ventless gas fireplace will eventually be installed. Can a permanent/semi-permanent sheetmetal block be installed in place of the damper? Greetings Mr. Howell, I want to make this as simple as I can. Take a moment and be sure to follow the manufacturer’s installation instructions in regards to the damper being sealed or blocked open as it may vary between ventless and vented logs and fireplace equipment. I’ve got a bit of a dilemma. The open and close rod on my damper has snapped. Is it possible to JUST replace the control rod or would I need to replace the entire damper? The damper worked fine prior to this issue. Thankfully, the damper is stuck in the open position so I can still enjoy a good fire. However, during the winter, my heat just rolls right up the chimney. If I DO need to replace the entire damper, where would one purchase one? I live in a condo, I’m not sure if that makes a difference. The units were built in the late 70’s and it is a wood burning unit. Thanks for donating your valuable time to novice people like myself! Your a very kind hearted person!! I will do JUST what you’ve told me. I bet dollars to doughnuts I can figure it out! I just repaired my heat pump with an online person like yourself helping me along the way. I was able to test all the wiring from inside the house outside to the heat pump. So surely I can do this!! I’ll keep you posted. And THANK YOU AGAIN for being such a nice person and having a forum in which to help DIY people like myself! Have a great weekend and Happy Independence Day!! Wendy, thank you so much for getting back to me. 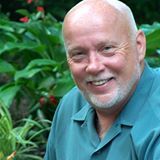 Just to let you know, I will be sharing your projects & comments with my five granddaughters. I love encouraging my five gals, with stories like yours! I have a pre-fab, the damper rusted and cannot be reattached. It appears that where the damper fell off, it exposes part of the internal pre-fab lining. Looking for options to repair, any suggestions? Top damper? Do I need to be concerned with the exposed gap where the damper used to be? A prefab or factory built fireplace is made with specific manufactured requirements this includes the damper when we add or subtract parts to one of these appliances essentially what we’re doing is modifying it which may drastically affect the UL listing I have concerns regarding rust at the damper if there was rust that caused the damper to fall out because usually, rust isn’t unique to only one appliance. Might I suggest before purchasing a top-sealing damper that you have a couple of chimney contractors come to your home and get opinions that make sense to you. This could be a very serious condition that needs to be dealt with before lighting an appliance in this again. Below is a link for a sweeps finder as well videos of replacing a prefab factory-built fireplace which is not a minor task. I caution you to check credentials and customer reviews on any contractor on a matter this serious. buying a house and fireplace was not used for 15 years. Damper looks very rusty and inspector said we need cement cap on top of chimney outside. Who can do this kind of work? If you’re in Cincinnati, you’re at the right place. American Chimney, 3310 Werk Rd. 513-662-4600. If you’re not in Cincinnati, go my recommendation would to go to the National Chimney Sweeps Guild. Find the Sweeps Finder. Puy your zip code in it and a number of sweeps will appear. Don’t ever be afraid to look up Google, BBB, and other reviews. My suggestion is to always ask for pictures both before and after the job. Our home is 21 years old. When we bought it in 1997, we immediately converted the 3 sided fireplace to gas. It has the original damper, which we’ve been told must remain open 100% of the time to avoid carbon monoxide entering the room because of the pilot light. So, we constantly lose heat and AC. Can it be replaced with something different so it’s not totally wide open? 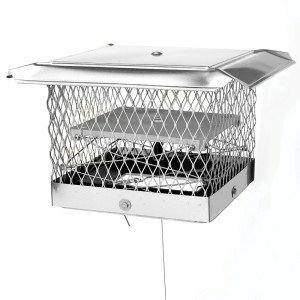 It is immediately above the firebox and is easily opened and closed with a long metal bar. BTW, we NEVER use the fireplace. Thank you, in advance, for your time. I try not to diagnose installation issues when the manufacturer is most likely still available online. My suggestion is to contact the manufacture of your gas fireplace unit. There should be a metal information tag somewhere “on or underneath” your gas unit. Call or email the customer service or engineering dept. I’m sorry but this a gas CO question, and way too dangerous to guess the right answer without seeing your installation! I need to buy a replacement damper plate for a cast iron unit that looks a lot like a Vestal, but I can not locate a brand on any of the castings. The issue is all the plates I see online are center-mounted handle mounts, and the setup inside my firebox has it about 5″ from the right hand side. The house was built in the late 60’s, and appears to be a 36″ unit as it needs a plate about 28.5″ wide and 6-7″ tall. Any idea on possible brands or where this style plate is available for purchase? I would recommend removing the cotter pins that most often hold a damper in a place. I would take pictures of the damper housing and the damper blade. I would go to every brick yard that is close to me. Buy the whole damper. Take the blade out. Throw the damper frame away. I’m SO excited to have found your site!! My sister’s ranch cabin has a regular stone-front fireplace with the inner area built with firebrick. It is in the corner. The damper seems to match the traditional lever-operated type. We have a problem with smoke filling the room every time it is used. We are hoping to find a solution. We added clay pipe segments to the chimney on the roof when someone thought it needed to clear the roofline to draft properly. It helped a little. My thought, upon inspection of the damper, is that the damper has a limited range of motion. It appears to be scraping/hitting on each side when you pull/push the lever. I think the inside metal sides are warped from heat. Another idea is that debris has fallen on top of the damper resulting in decreased range of motion. And, finally, the pipe going up to the roof seems to be offset to the back. So, the smoke has to go backwards and then up. 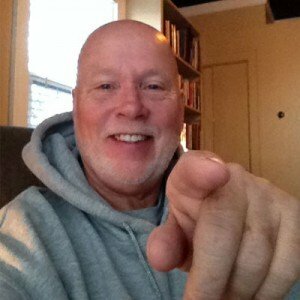 I’d be grateful for your help with confirmation/dismissal of my crazy ideas. First off, I think I need to hire you as a consultant. All your analogies are on target. Starting with the top of your chimney, I wouldn’t hesitant to put another form of pipe up there if its for testing purposes only then a more permeant fix can be addressed later. I personally would not hesitate to take a hammer and bust that damper out. And then I would have to I get a piece of sheet metal to cover the front of it prevent from downdrafts and any possible animal entry, speaking of that I recommend keeping a cap installed at the top. You’re right the limited motion is most likely stifling the draft. Let’s go back to some basics: Make sure you’re using dry seasoned wood and starting your fire with small pieces of kindling, larger pieces as it heats up. Kind of like the boy scout/girl scouts fires we all learned to build. Its been in my experience it takes about 45 minutes for the masonry fireplace to heat up to achieve maximum draw. Burn safe and warm. Our new house in Lexington, KY was built in the 1930’s with two fireplaces, one in the basement and the other directly above it on the main floor. 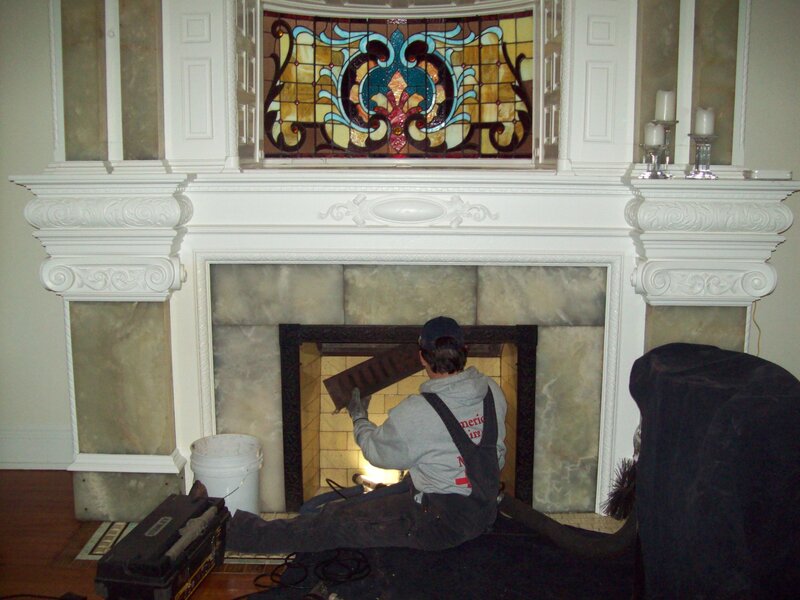 We just recently installed vent-free fire-glass trays in both fireplaces and they function perfectly. The stone fireplace in the basement has no damper so we lose most of the heat it produces up the flue. The new gas line pipe which was installed on the floor above it apparently bisects the chimney flue to get to the upstairs fireplace (no one realized this was the case at the time of installation). People have told me that this is not only not only a code violation but is a prescription for disaster as hot air rises from the basement fireplace below and heats the gas line. As a result, I am afraid to use the basement fireplace. One solution would seem to be to install a custom replacement damper in the basement fireplace and keep it closed. Do you agree? Without seeing this the solution seems to be well-thought out. It sounds like you’ve had some good council thus far. I really wouldn’t know what to recommend than what was already presented to you. Vent-free equipment is always very touchy and you might want to consider consulting with the manufacturer. They all have customer service and engineering departments. I’ve been told the removal of our rotary handle on the face of our fireplace so i can resurface the face is not an option. Since it’s a moving part I find that challenging to believe. Looking to resurface the face and would like to remove the handle, lay tile and then put the handle back. I’ve done this to a couple fireplaces, but have not had a rotary handle to work around before. Could not find any how to videos. I realize it’s usually never a matter of if, but rather how much. With that said I prefer to learn along the way. Lock Top II damper. https://www.youtube.com/watch?v=uPjz587Ylpw Doesn’t get any easier than that sir! Sorry for the delay, my dog ate my homework! ?